The Wrench – October 2017 : Squad – Communicate. Coordinate. Conquer. October may be over for a while, but thanks to you awesome modders out there we have great things to show this month. If you haven’t had your fill of treats from last month, we’ve got a special inclusion direct from Offworld: Steam Workshop Support. Join us on the Community Modding Discord where you can join discussions and meet the modding community. It’s a great place to share your ideas and passion with like-minded people that will be happy to help you along the way. A map based on the real world Skrunda-1 abandoned Russian base, but taking inspiration from both Fallout and S.T.A.L.K.E.R. The eerie hue and ravaged landscapes will have you looking over your shoulder for Deathclaws. Shudder. We are loving the style! 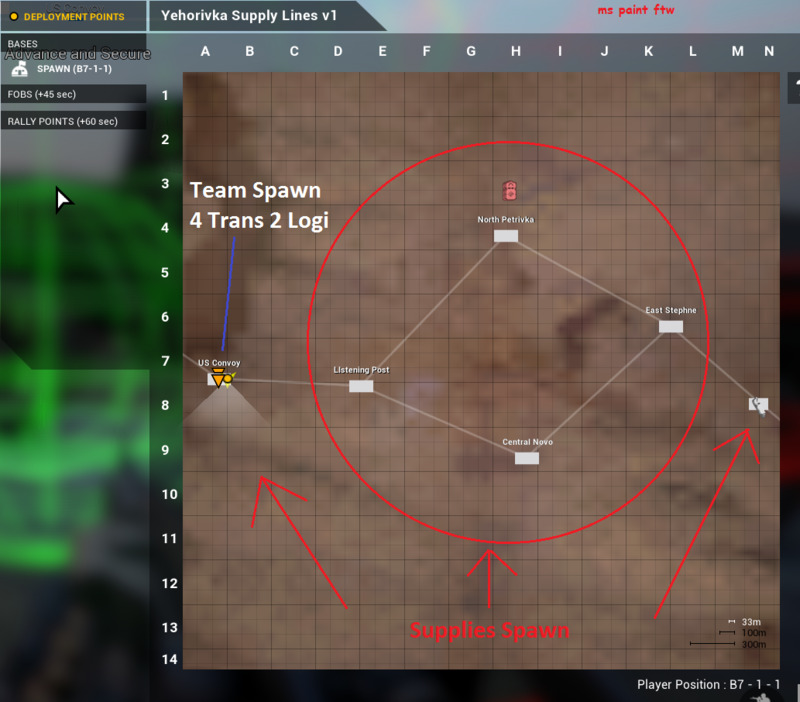 Supply lines is a new game mode Bill Nye has been working on that hopes to add some depth and variety to standard AAS gameplay. The core gameplay revolves around the balancing act between capturing AAS flags as normal, and establishing and defending supply lines. Supply lines will consist of “Supply Crates” spawning that can be picked up by logistical trucks to refill their supplies. Each team will receive a supplies at their start point every 10 minutes that will be easy to secure, and a third supply crate will spawn randomly on the middle of the map somewhere. 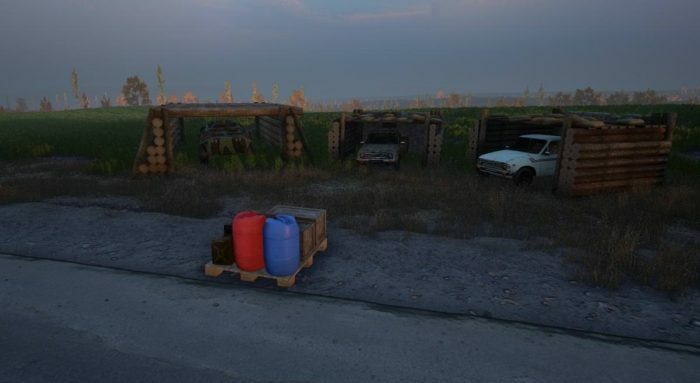 As the game mode will not feature main bases, these supplies will be instrumental in setting up the FOBs the team will require to spawn. These fobs will also receive significant buffs to their spawnability as well as having the cost of defensive fortifications and emplacements. With most deployables, like sandbags and hescos costing 0 supplies, but being limited by number and defensive emplacements costing considerably less. 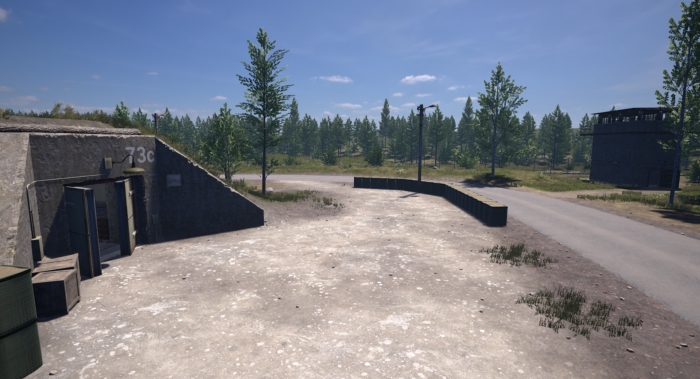 The main use of build supplies will be the construction of vehicle garages that will be used to spawn vehicles for the team. These will be placed by the Team Lead and allow each game to feel unique with different FOBs acting as main base and different vehicle loadouts chosen for each side. The team that wins will be the team that chooses the right vehicles, secures their supply lines, while maintaining a presence on the capture zones. Communicate, coordinate, and dominate, squaddies. One of our favorite frequent flyers, Socrates brings us an update on the Khe Sanh Combat Base. The focus of this month was to create a realistic waterfall scene with secret tunnels, showcasing just how diverse this map is growing to be. A small group of Finnish players have started to bring the Finnish Defense Forces into the fold. 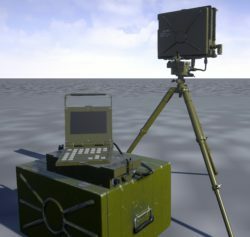 Finland has a lot of unique assets and a great amalgam of older Eastern technology and gear, together with modern Western tech. All of this makes the Finnish Defence Forces a great fit, and we’re looking forward to what these dedicated Finns are bringing to the table. A result of cooperation of an artist and a programmer, interesting bit of electronic warfare, the Fara-PV, russian-made portable radar station capable of detecting people and vehicles up to 6km away (limited to 800m for balance reasons), although it can only detect targets in the clear line of sight, unable to penetrate any obstacles. The operator can use 15 meters long cable to hide the control unit (and himself) in the nearest cover. Based on an island in Eastern Europe, this map will have it all: cities, villages, bunkers, highways, dirt roads and forests! The Russian Ground Forces team will start in a bunker in the south eastern corner of the map and will have to fight their way through fields, hills, camps and a ruined castle towards the US Army troops that have established a foothold near the northwestern corner of the map. Join the work-in-progress forum thread. Lots of progress has been made on the West Bank map previously showcased by Creative Realms, including the creation of improved olive terraces, a barrier wall model, as well as some new custom deployables (although this is still only a small portion of what has been added). Feel free to check out the behind the scenes development album too! A new update on the Minimi that we already showed a while ago, now it’ss beginning to get some color! The textures are currently Work In Progress, but already look like a great start. He hopes it will convey the feeling that it been in service for a while. “It wouldn’t hurt to add some dust here and there,” Pawin notes. “It has been extremely rewarding to see the gun come to life.” He would like to give a big shout to the SMF team for all the hard work and support. Ian found sourcing reference material for this radio, but was still able to come up with fantastic results after four days of hard work. 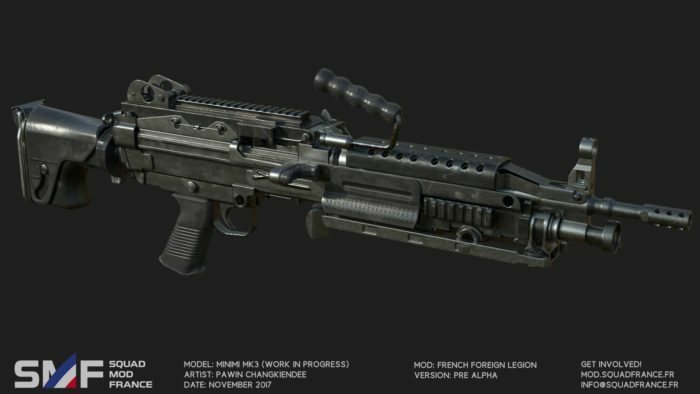 High poly was 4 million polygons, while low poly is 1.4k polys. The textures clock in at 2k, as it is a minor item to be worn by the player. 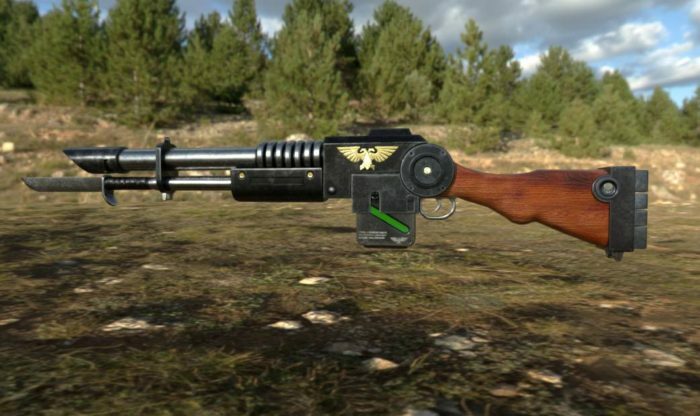 The “There Is Only War” mod team is looking to free the universe of the chaos with the start on their futuristic Warhammer 40k Lasgun. 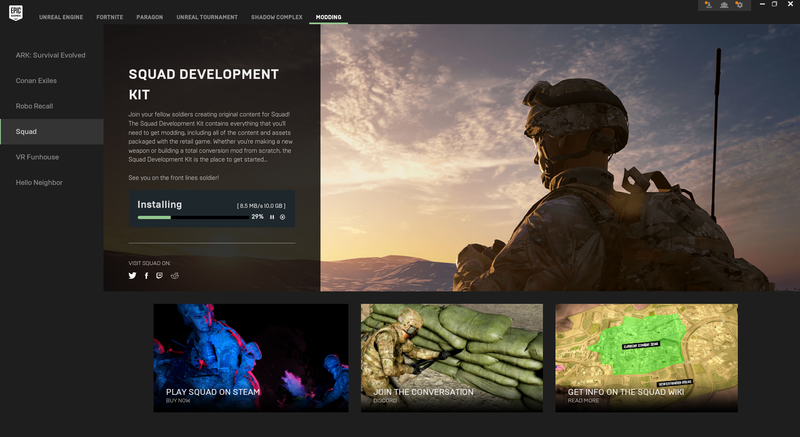 Looking forward to how it will look inside Squad and what a future total conversion in this universe could bring! 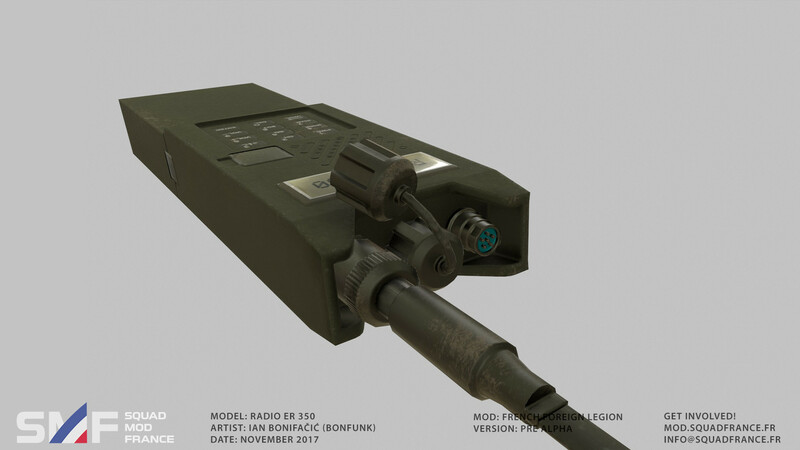 Model is done by Justin Maclin and Defcon, Texturework is by Der Kommissar. Steady progress was made on Samland Peninsula. More villages, as well as an old factory and an ammunition depot were added. 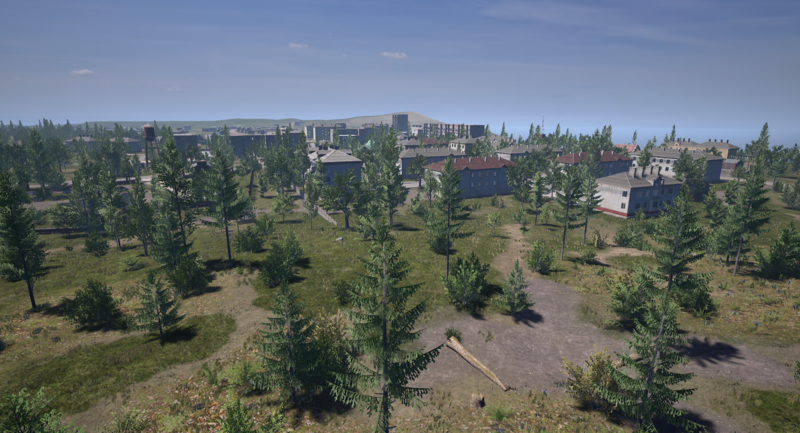 Legion_X is currently focussing on the town area which takes the most time to design. He hopes to finish it in about a month, we’ll make sure to keep everyone updated. 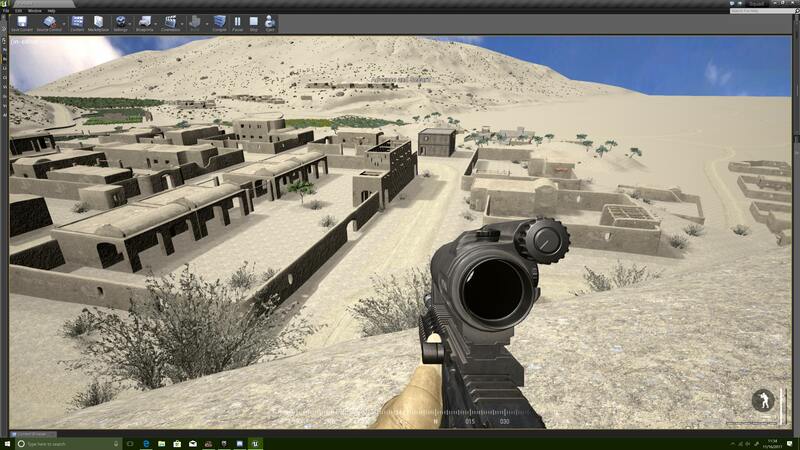 Inspired by Kashan Desert from Project Reality which was originally created by Duckhunt, Sarau is a 16km2 map focused on a combined arms combat. 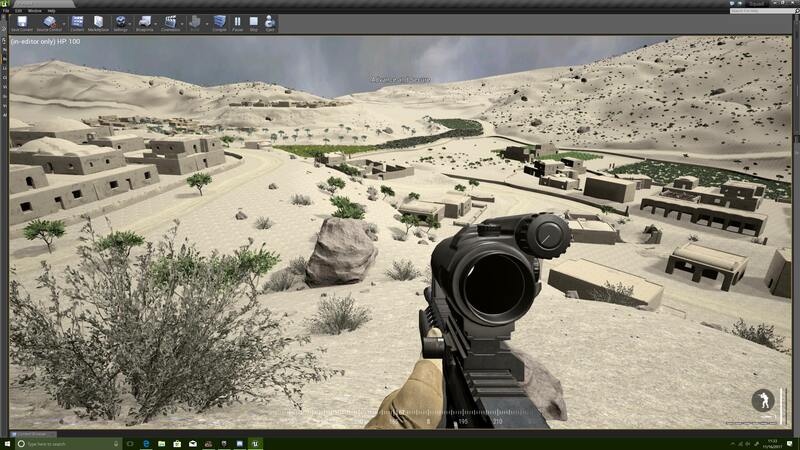 The centerpiece of the map is a large military facility in the Sarau Desert which offers medium to close quarters engagements for infantry while you can expect most of the vehicle combat to happen in the wide open desert and oil fields around the military facility offering medium to long range engagements. Taking a real world location from Afghanistan, SaltySeaKook has taken a solid base and run with it. 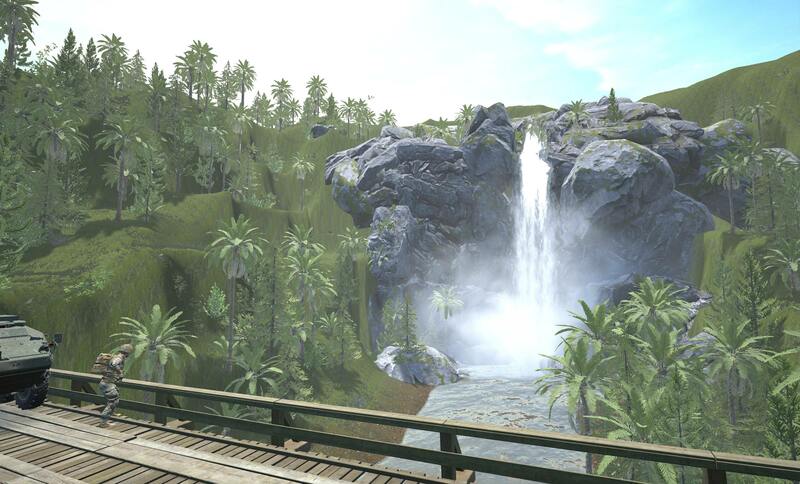 Looking to offer an interesting play style, it will have lots of vegetation, in addition to an urban area. The intersection of two valleys will play host to smaller villages and farms as well. Rocky, steep hills ensure that both the villages and the terrain hosting them will ensure hard-fought battles, with or without vehicles. It’s here! It’s finally here! If you’re interested how we got here, under the experience guidance of Zak Strange and Chris Greig, check out the previous The Road to Modding. Caught up? Good. We’ve got some ground to cover! Remember, you can always find these directions in the Squad Field Manual. The following guides assume you have the Squad SDK installed already. It’s a large download, so you may want to start that now. Need a hand with that? 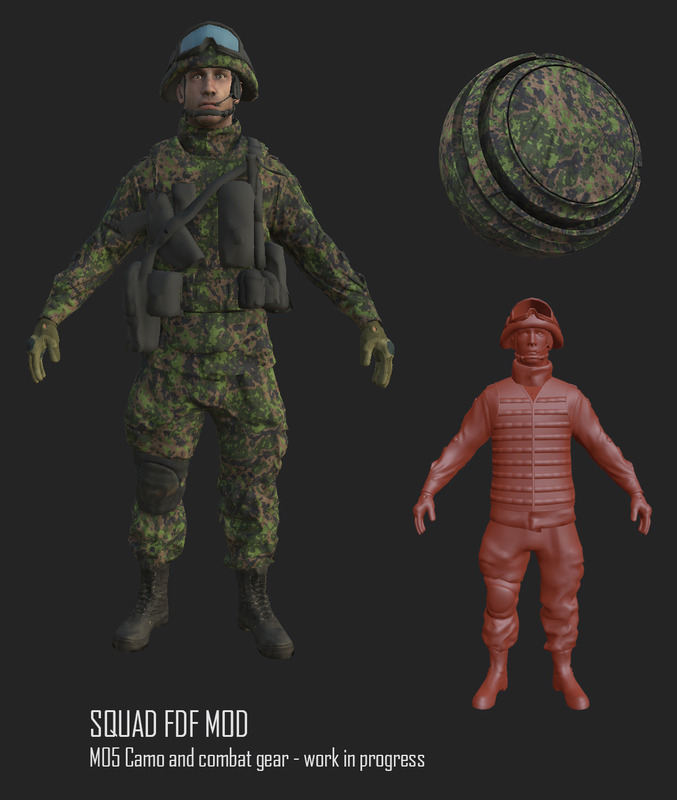 Check out the Squad Field Manual. Additional guides for server administrators can be found under the Modding category of the wiki. Click the “Create Mod” button. Fill out the Create Squad Mod form. Note: This information will be visible in Steam Workshop. Note: Mod names cannot have spaces or special characters. Listen to the form! Click “Create Mod.” You should receive a “[yourmodname] was created successfully,” notification. Click the button with the 3 horizontal lines next to “Filters” in the content browser. All of your mod’s content should live here. Package your mod so that is playable. 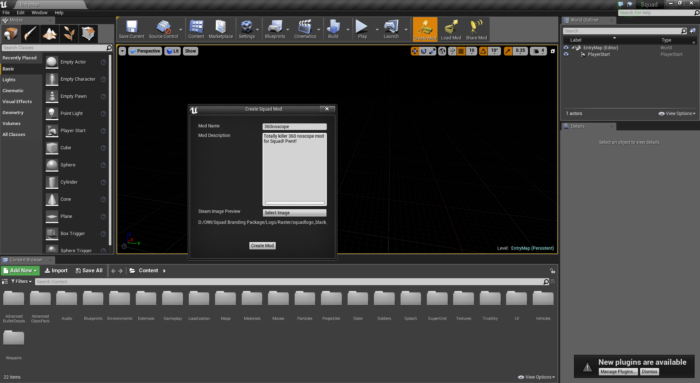 Navigate to output folder that now containers your mod package. Danger: Do not modify the folder with the name of your mod! Navigate to your Squad install directory. Create a folder named Plugins. It may already exist. 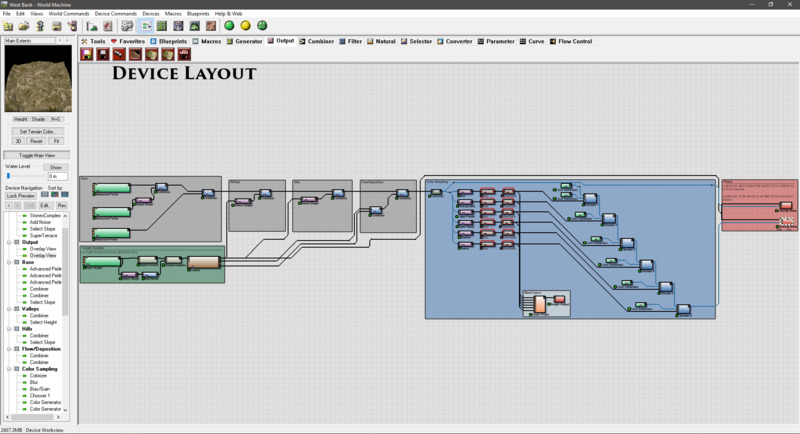 It should resemble this: X:\Root\Games\Squad\Plugins. Inside of Plugins folder, create a folder called Mods It may exist already. Copy your mod from the output folder above to the Mods folder. Boot into Jensen’s Range and AdminChangeMap from the console. Brag to your friends. You’re a modder! Click “Share Mod” button on the toolbar. 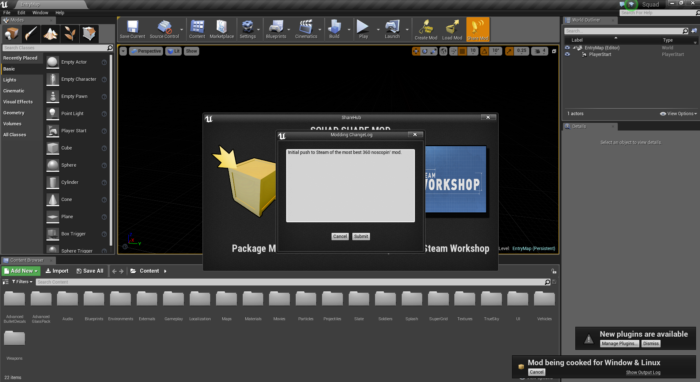 Click the Steam Workshop image. 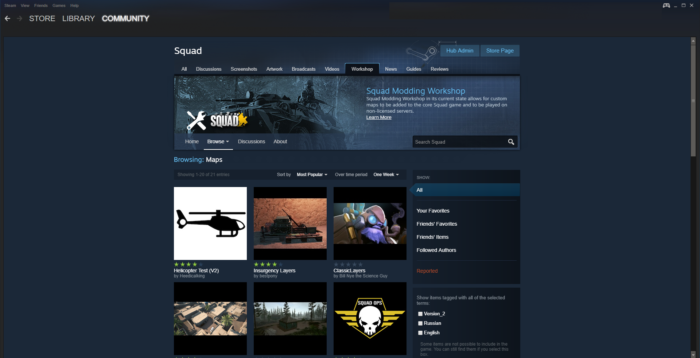 This may be as simple as, “Initial release to Steam,” or a detailed list of changes. Enjoy life as the progress bar churns toward completion. This may take some time. Note: Once completed, it may take some time to appear on Steam. Note: Steam performs maintenance on Tuesdays, during which most features are inaccessible. If your mod does not appear within a few hours, please consult the FAQ for assistance. Open Steam and navigate to the Steam Workshop. Locate your mod in the Workshop. 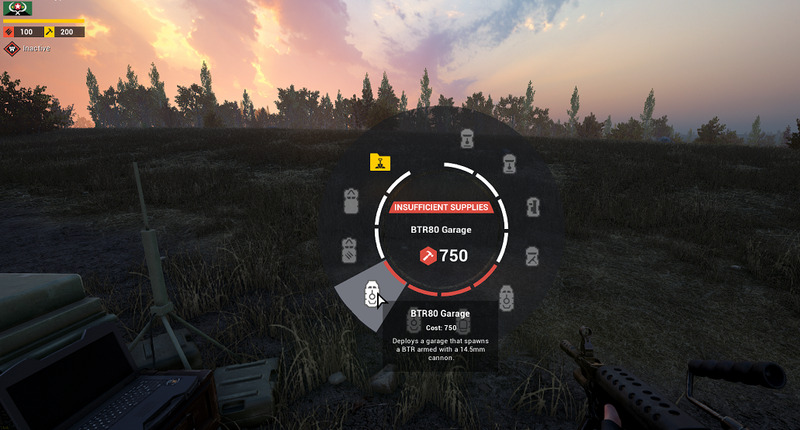 Brush up on your squad leader etiquette while it downloads. Remember, advanced guides and guides for server administrators can be found under the Modding category of the wiki.